David Blanchard reported in a comment to previous post that Hurricane Ginger of 1971 holds the longevity record for documented hurricanes. Ginger persisted in the Atlantic Basin for more than 27 days - so Nadine has to persist for another week to challenge Ginger. The two graphics below are from the NHC archives - top lists 1971 Atlantic Tropical Storms and bottom shows Ginger's long, wandering track. Interesting weather this morning is mostly far removed from Arizona. Hurricane Nadine (8 am EDT image above) has been wandering around over the Atlantic - far from the continents - for days now. A portion of Nadine's track is shown below. The first forecast discussion for TS Nadine was issued at 11 am AST on September 11th. The 11 am discussion this morning is number 68. I don't know what the longevity record for TS/Hurricanes is, but I would think that Nadine must be a contender. Over the US the most substantial storms and rain this morning are centered over Texas (national radar composite for 1524 UTC above). Moisture from both Miriam and short-lived Norman is playing some role in this event. 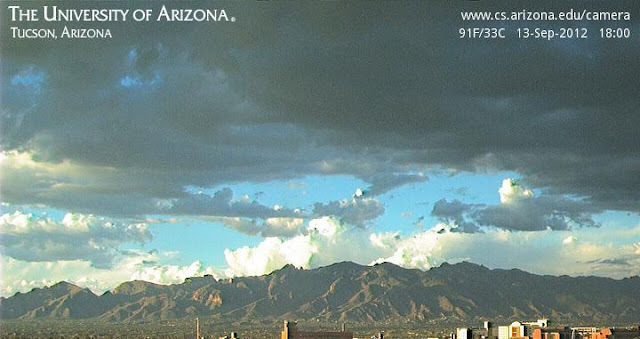 There is still some moisture and a bit of CAPE over eastern Arizona and there may be isolated storms over the mountains this afternoon. Steering flow appears to be from the northeast. Over the western Pacific, Typhoon Jelawat (once a Super Typhoon) is headed toward Japan. When Jelawat becomes an extra-tropical storm it will play an important role in ridging over Alaska. The circulation changes will probably send a cold high into the US by the end of the coming week and perhaps threaten the Colorado front Range with its first snow of the Fall. 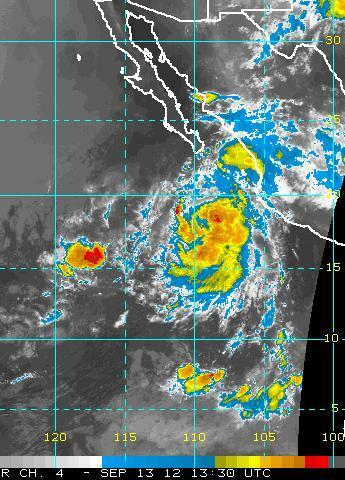 Edited at 7:30 am MST - The NHC has declared that the disturbance over the southern GoC is now Tropical Storm Norman. It is expected to move north fairly rapidly and be inland tomorrow. The above is the 5 am composite radar image from the TUS NWS radar, showing widespread, light echoes across most of southeast Arizona. The echoes are mostly aloft and only a couple of stations have reported rainfall. Nogales received 0.02" - so not much in the way of real rain. Moisture has inched upward upward - surface dewpoints are highest to the west, but increasing locally. Values of PW have also increased. 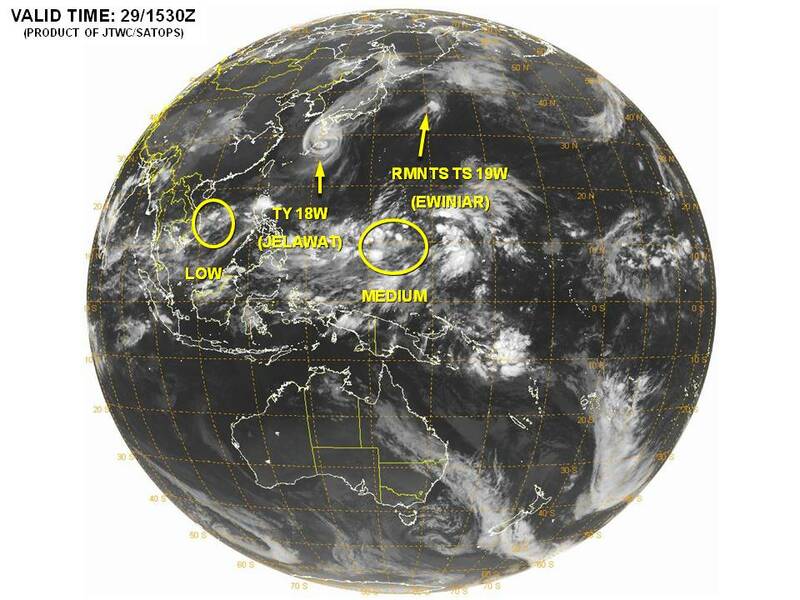 But the significant activity associated with now decayed Miriam remains to the south. 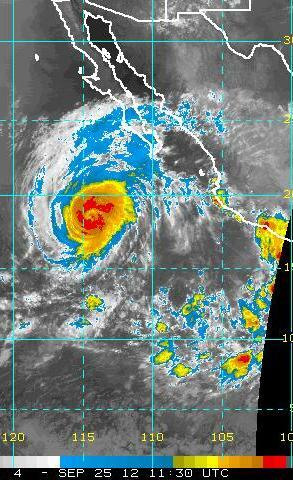 The 1130 UTC IR image shown above shows the remnant circulation of Miriam out to the west of the south end of Baja. There is significant deep convection over the south end of the GoC, and this is associated with the disturbance I mentioned yesterday. The NHC indicates that a tropical storm may be forming in this unusual location (see below). However, the large-scale pattern will be trying to keep the tropical activity and associated high moisture to the south. This new system does warrant some attention, especially in the next 24-hours or so, before ridging at 500 mb over the west pushes things further south. Miriam has provided a nice example of how far off the global models, and NHC, can be at times. The IR image above is from 7 am MST. Miriam can hardly be seen, since she has become a shallow remnant low without deep convection. A large plume of cirrus from Miriam extends northeastward into southeastern Arizona, and there appear to be active storms over western Mexico south of 30 degrees N. The thin cirrus produced a halo around the nearly full moon early last night. The surface dewpoints at Yuma have jumped again into the low 70s, but the moisture is shallow. A last gasp from Miriam could be isolated showers along the Borderlands during the afternoons today and tomorrow. The IR image above also indicates another tropical disturbance south-southwest of Cabo Corrientes - this may become a new TD or TS later today or tomorrow. The above is the latest NHC forecast of Miriam made at 8 am this morning (27 September). Below is the NHC forecast from 8 am on 24 September. What a difference! Update Wednesday 26 September - The latest NHC forecast (added below the other forecasts at the bottom of this post) for now TS Miriam has continued to change quite substantially. The storm has weakened and moved west of earlier track forecasts. The forecast now indicates Miriam to drift slowly northward fairly far west of Baja - this is similar to the behavior of TS Kristy during the latter stages of her life. So, the dangers inherent in 5 day or longer forecasting are well illustrated here. Current Atmo early WRF-GFS forecast brings higher PW northward but keeps it along the Borderlands and into southwest Arizona. The model develops marginal CAPE in the same areas next two days. So it goes. Update - edited to add the NHC 8 am forecast (down at bottom). The latest forecast has kept Hurricane Miriam on the same track, but slowed down her speed. The result is that the forecast for Sunday morning indicates Miriam still offshore south of the Baja spur. 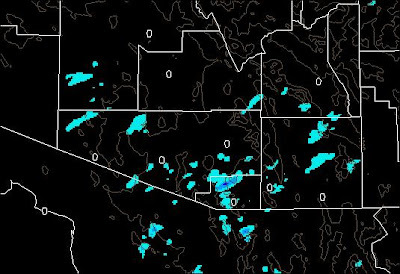 Yesterday afternoon there were isolated, very light showers around southeastern Arizona, much as forecast by the models. The high temperature at TUS reached only 97F, after 4 days of 100F or just over. The Hurricane Miriam situation remains as the main focus for the rest of the week. The storm was briefly at Cat. 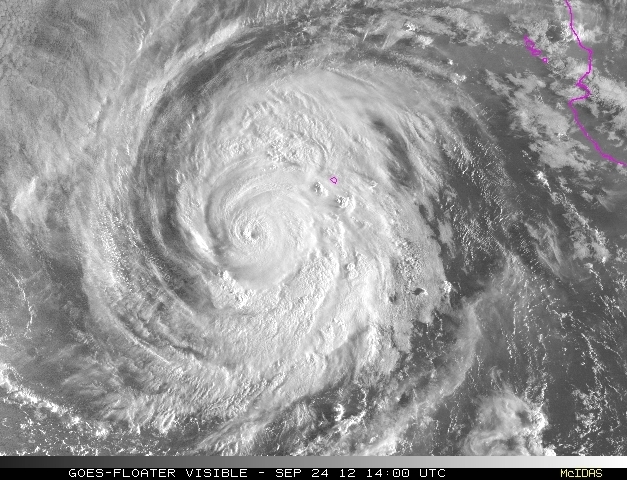 3 intensity yesterday and is currently (see IR image above from 1130 UTC this morning) a Cat. 2 hurricane. The storm is moving a bit more slowly than was forecast yesterday, and remains south of Latitude 20N. The forecast from NHC this morning remains similar to that of yesterday. 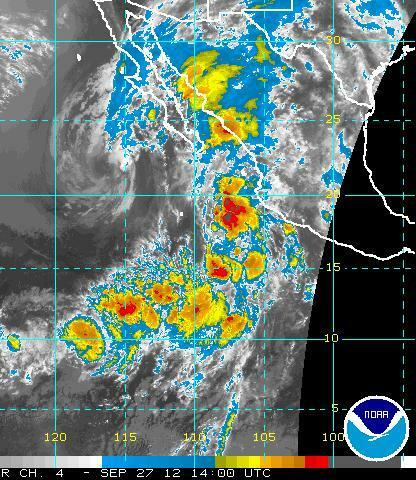 The storm is forecast to reach central Baja over the weekend. While low-level moisture will increase over southern Arizona, the precise impacts on our weather remain somewhat uncertain. There continues to be a very large spread in the global model forecasts, meaning that there is a considerable range of weather possibilities for southern Arizona (and California) as the storm moves northward. This continues to be a situation where we will just have to watch how things progress. A short-wave trough at 500 mb is approaching Arizona this morning and will be moving slowly eastward. It appears from the model forecasts that this feature will weaken and stagnate over western Arizona. Middle level temperatures are col across the state and some convection is likely with this wave. 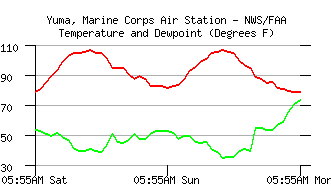 The dewpoint temperature has jumped upward at Yuma ahead of the short wave - see current time series above. This morning's early forecast run of the Atmo WRF-GFS actually forecasts some isolated light showers and rainfall across southeast Arizona through midnight tonight see below. Miriam (7 am visible image above) has likely strengthened to a Cat. 3 hurricane this morning, and may strengthen further. The current NHC track forecast below takes Miriam on a path that will trigger a surge of low-level moisture up the GoC. This initial impact of Miriam will likely occur 36 to 48 hours sooner than the GFS/NAM models indicate. I expect that the push of low-level moisture will be into southern Arizona during Wednesday night or Thursday morning. The key question then will be whether or not convective instability will be increased enough to support thunderstorms. By Friday and Saturday long-range model forecasts indicate that the remnants of Miriam will be affecting the Southwest directly. Thus, a very interesting week on tap. 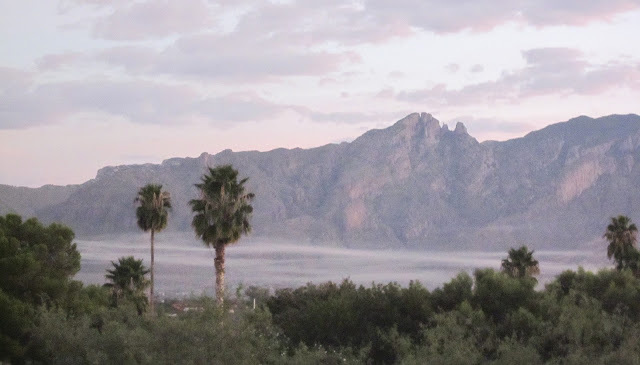 At sunrise this morning (Sunday, September 23rd) there were filaments of smoke along the Catalina foothills, as shown in the photo above taken looking north a bit after 6 am. The smoke was trapped in the stable flow that was drifting from east to west. No info on internet news about the nature of the fire. 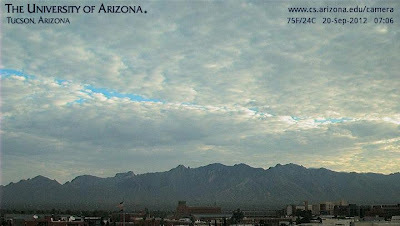 Edited to add: The Tucson sounding from 00 UTC (above), released a bit over an hour after the detected lightning strike. What can I say? During the heat of the afternoon today (Saturday, 22 September) the shallow convection at the top of the deep boundary layer produced weak radar echoes (above is 1.5 degree tilt at 3:10 pm MST). 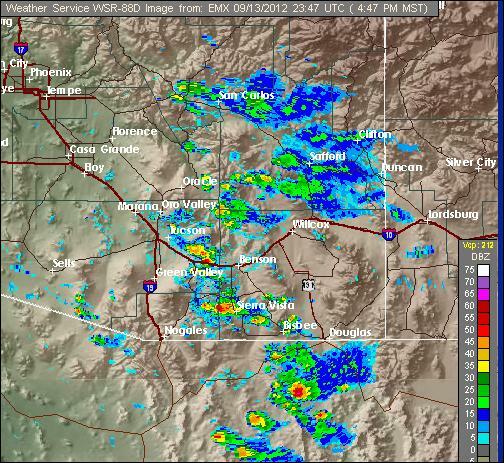 One tiny cell southwest of Tucson indicates reflectivity of 35 to 40 dBZ. 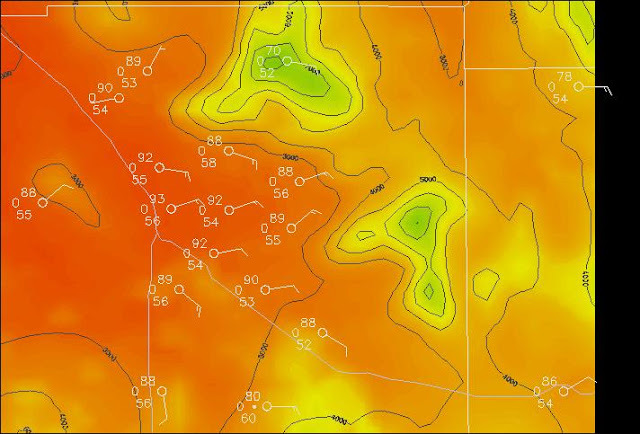 This shallow cell apparently produced a CG lightning strike (below is IR satellite data with CG superposed at 2:40 pm MST) - note the red dot (indicating a detected CG) associated with the echo above. The radar reflectivity is large enough to indicate that graupel was present in the the convection, so the detection is probably valid. The image above is VIL at 3:10 pm - values are very small, although the slowly varying color scale prevents me from making an estimate. The image below is radar detected echo tops at 3:10 pm. Note that the echo tops are only in the 18 to 22 thousand ft range - which certainly fits the morning sounding (see previous post). 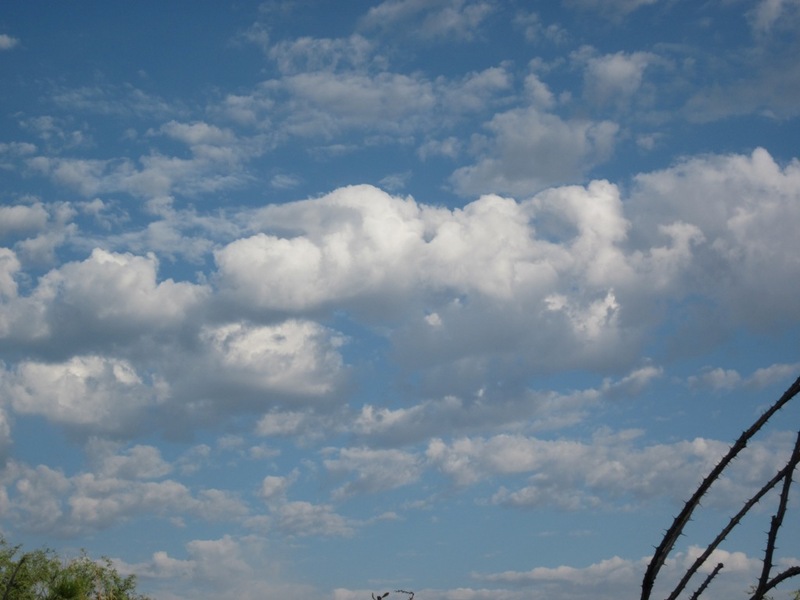 It appears that we had a thunderstorm produced by a remarkably shallow cumulus buildup - quite amazing actually. Regarding the previous post, Mike Crimmins commented that the clouds looked like, from the satellite perspective, celluar convection over the cold waters of the Pacific. Indeed, from the top, the morning clouds the last several days have looked a bit strange. 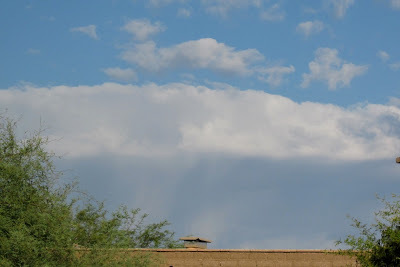 This morning they were around again (visible image above from 7:15 am MST), and they were producing quite a bit of virga, and one or two slight higher towers had mammatus. The photo below shows how shallow these clouds were this morning. The morning sounding from Tucson (above is skewT plot of 12 UTC data from Univ. of Wyoming) shows that the atmosphere is essentially split in half. The old boundary layer from yesterday afternoon fills up the lower half, reaching up to about 500 mb with light winds, generally from the south. Above that the top half of the atmosphere is probably weakly subsiding with northwesterly flow around an upper-anticyclone, and producing a nasty inversion just above 500 mb. So, the morning clouds are trapped within a very shallow layer centered around 500 mb. The temperatures in the cloud-layer are a bit colder than -10C, so that the weak updrafts are very effective in producing ice crystals. This leads to some significant virga (see photo below) as snow falls from the shallow clouds. We see things like this a number of times during very hot and dry conditions, but rarely are such clouds so widespread as they've been the couple of mornings. Off to the far south, the NHC is now tracking TS Miriam (see below). The NHC predicts that Miriam will become a hurricane as it moves toward the northwest, staying fairly far out in the Pacific. The storm is predicted to turn on a more northerly course after it weakens mid-week - much like TS Kristy did. Thus, the details of how the storm might affect the Southwest remain nebulous. Several of the GFS ensemble members bring the storm much closer to Baja than does the NHC forecast. However, the GFS ensemble members have a very large spread wrt the forecasted center of Miriam at 120 hours - so we'll just have to watch as things evolve at lower latitudes. It was a very warm morning today with a low here at the house of 68F - low at airport appears to have been 75F. The warm temperatures were the result of broken to overcast middle clouds during the night. 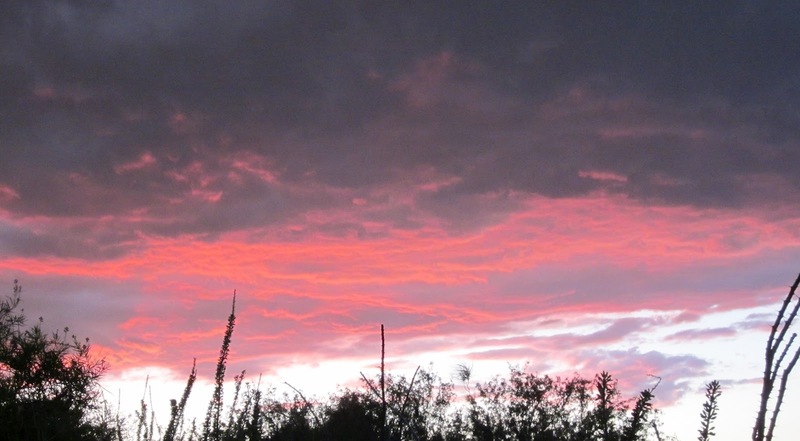 The clouds provided a flaming, purple to orange sunrise. Just before sunrise I came across a little herd of Javelina (at least 3 that I could see) down at the end of Country Club - they were slowly making their way back toward the Rillito, after scavenging through some neighborhoods. Above is webcam view of Catalinas, and the cloud deck, just after 7 am MST. 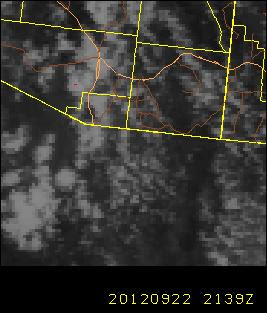 The clouds developed over southern Arizona and northern Sonora yesterday afternoon and evening within a weak, middle-level inverted trough. Visible satellite image below is from 6:45 am. 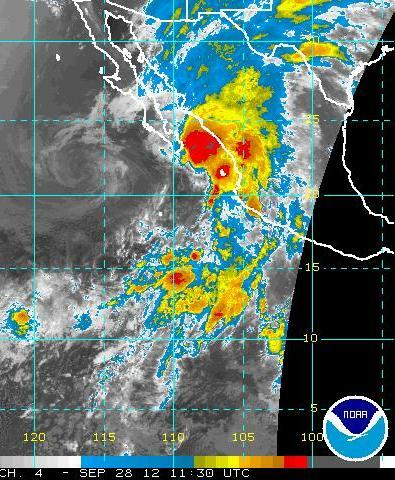 indicate the tropical system moving northward up the west coast of Baja. If the forecasts actually verify, this tropical system could bring southern Arizona some rainfall as September ends. Not much weather for western third of country these days. High yesterday at TUS was 97F - low this morning at the house was 56F - so big diurnal ranges, with the low humidity and clear skies. 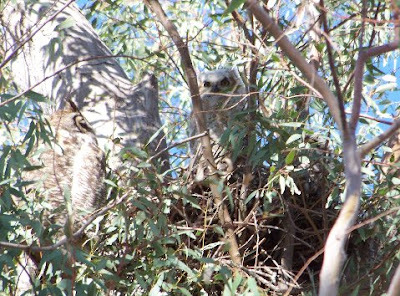 When I walked at dawn this morning I saw a big Horned Owl down in the park next to the Rillito. Couldn't help but wonder if the pair who nested there last spring have returned - one of the pair and one of two nestlings above. 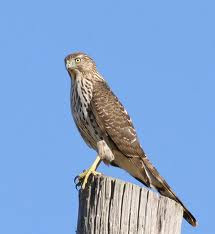 There were also a number of Cooper hawks out hunting through the tree-tops this morning - below (not a local photo). Long-range forecast models keep the Eastern Pacific active, so maybe there's a tropical storm in our future that will do more than Kristy did. The summer thunderstorm season is over, and Fall will officially begin in a few days. During the summer our rainfall amounts by month were: June 0.05" (0.34"); July 2.91" (4.13"); August 2.75" (1.17"); and September through the 15th 0.62" (0.38") - Total = 6.33" (6.02"). Values in parentheses are for the airport (TUS). Normal at the airport is 6.08" and the amount here is about in the middle of years I have records for (1999 - 2012). So the summer was neither very wet nor very dry at these two points - although, it has apparently been quite dry over the grasslands of southeast Arizona. Here at the house there were 9 days with 0.25" or more; 4 days with 0.50" or more; and 1 day with an inch or more (1.57" on July 15th). It appears that 59% of the summer's rain fell on only four days and within a total time period of only about 4 hours. The key events that determine the rainfall character of the entire season tend to hit very quickly. The above graphic shows GPS measured precipitable water (PW) at the University campus from June 14 through September 17th. There were several dry periods during the summer, most notable were those during August. 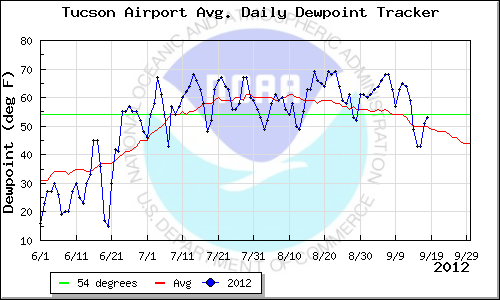 below is a graphic showing the average daily dewpoint temperature at the NWS observation site at the airport. generally the Td tracks well with the GPS PW - 54F was the old monsoon definition's key value (which corresponds quite well with PW of 30 mm).. 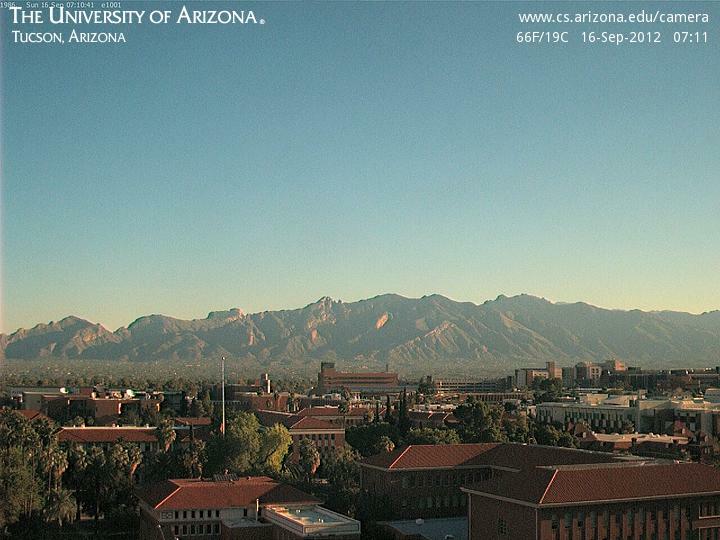 It is very nice and dry and clear morning here in Tucson. View of the Catalinas above from campus at 7:11 am MST. The PW has gone down during the past five days (see time-series below) and is now around or below half an inch and the summer storm season is history, as per comment on one of the posts earlier this week. The RAOB data has been very close to the GPS values, and even a bit too wet on a couple of days. TS Kristy managed to get low 60 dewpoints into Yuma over night but that's about it from that storm. Was very pleasant here at house at sunrise, with a low temperature this morning of 53F. Weather focus next few days will be on a strong cold front that will bring Fall-type conditions to much of the central and eastern portions of the country, particularly in the Great Lakes Region. The WRF-GFS forecasts from Atmo were quite good yesterday. 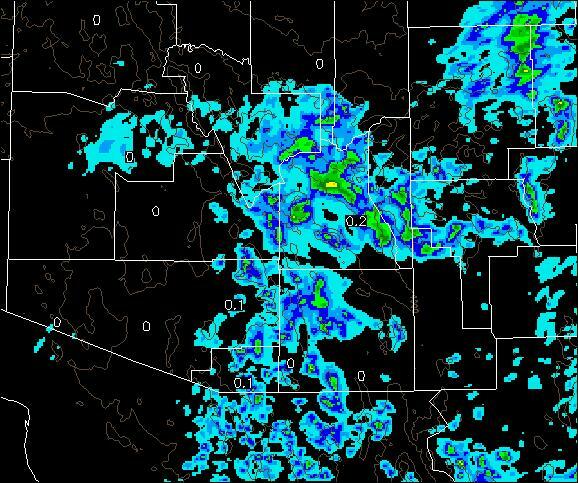 The 4:45 pm TUS composite radar image (above) indicates storms into eastern Pima County. Here at the house we had only a few sprinkles and a trace of rain.Atmo and TUS measured light rain with the thundershowers that affected primarily south and east portions of the local area. Atmo had a gust to 57 mph as the storms went by. Across the ALERT network 24 of 93 stations had measurable rain during the past 24-hours. Couple of stations reported over half an inch of rain. Above web cam photo from Computer Sciences was at 6 pm MST, and the purple-red sunset shot below was from the house. Very windy along the Rillito at sunrise this morning. The short-wave at 500 mb has closed off and will be nearly overhead this afternoon - looks like temperatures at 500 mb may be the coolest they have been in about 3 months. The 500 mb low moves little during the next couple of days, as it weakens overhead. Appears that east to northeast winds will keep mT air south of the border, keeping any Kristin push at bay over the GoC. A large, bent-back ridge sets up at 500 mb from western US into Alaska next several days, transitioning us into warm, Fall weather. 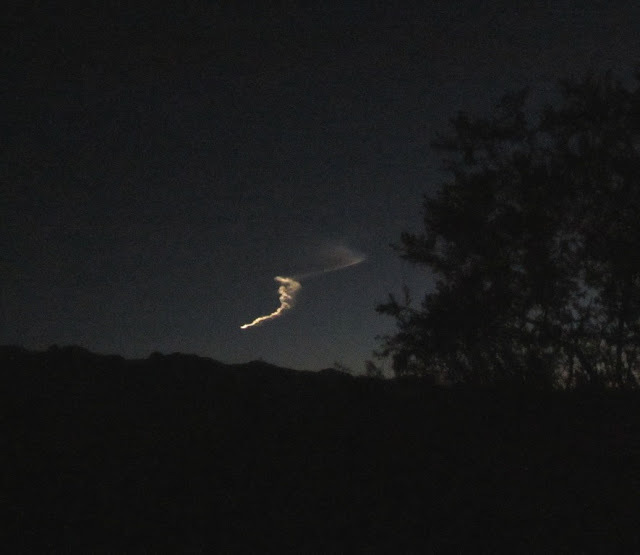 This morning a rocket test at White Sands produced an exhaust cloud high in the upper-atmosphere before sunrise. The trail was very bright and my crude photo (above) doesn't begin to capture its brightness. A few minutes later I watched a large Javelina trotting along the Rillito Wash. Tropical Storm Kristy is located south of Baja this morning (above is IR image from 1330 UTC), and will try to push moisture back north up the GoC. 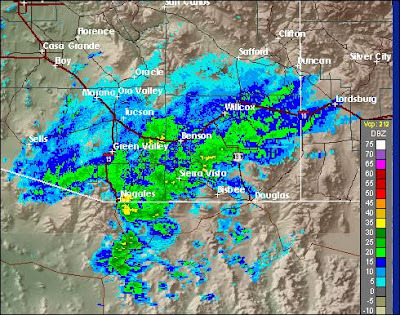 However, rising pressures in southern Arizona may keep the moisture south of the border. The cold front pushing across New Mexico has reached to near Lordsburg this morning - above is 7 am MST surface plot from NCAR RAL. I did a quick check on 24-hour pressure rises over southeastern Colorado and New Mexico and found rises of 10 to nearly 20 mb. Pressures are also rising over northern Arizona, so southern Arizona is in a real squeeze. Winds will pick up this afternoon as the front backdoors into southeastern Arizona. This morning's early WRF-GFS forecasts some showers ahead of the front this afternoon. Below is the WRF forecast of rain fall through midnight tonight. A surface front with much cooler temperatures and rain is pushing south down the Front Range and northeastern New Mexico this afternoon (surface plot for 4:30 pm MST from NCAR/RAL above). This front will backdoor into southeastern Arizona tomorrow morning with gusty east winds by afternoon (below is WRF-GFS, 12z run, forecast for 3 pm tomorrow). The main impact of the front will be the change in winds. The downslope winds and sunshine will actually lead to warmer temperatures than we had today. The WRF does forecast some storms during tomorrow afternoon, mainly in Santa Cruz and Cochise counties. Snow On Mt. Charleston Yesterday? What Will This Afternoon Bring?